You Are Stardust begins by introducing the idea that every tiny atom in our bodies came from a star that exploded long before we were born. From its opening pages, the book suggests that we are intimately connected to the natural world; it compares the way we learn to speak to the way baby birds learn to sing, and the growth of human bodies to the growth of forests. Award-winning author Elin Kelsey -- along with a number of concerned parents and educators around the world -- believes children are losing touch with nature. This innovative picture book aims to reintroduce children to their innate relationship with the world around them by sharing many of the surprising ways that we are all connected to the natural world. Elin Kelsey is an internationally respected leader in the field of environmental science and education, as well as the award-winning author of "Not Your Typical Book About The Environment" and other books for children and adults. She consults around the world on environmental projects and is an adjunct professor at the Monterey Institute of International Studies and Royal Roads University. She lives in Pacific Grove, CA. 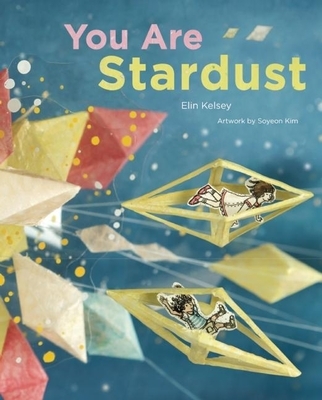 "In You are Stardust, Elin Kelsey works magic. This lyrical book effortlessly connects kids to their timeless origins, and the natural world, while teaching them science too. Soyeon Kim's playful illustrations will allow children's imaginations to run wild, even as they will hang on the book's every word. Bravo!" "We are made of earth and water and air and stardust, and we are more related to animals and plants than we ever imagined. Everything about us is found in the natural world. Our atoms are from ancient stardust, and the water and salt that flows within us is part of the unchanging cycle that goes back to the beginning of time. We breathe pollen that, when released, may actually create a plant. We grow at night and seasonally shed and grow hair, in similar fashion to animals. We are also a living planet for millions of microorganisms. Kelsey doesn’t lecture or overcomplicate the information. She speaks directly to readers in a way that opens minds to big ideas and paves the way for thoughtful questions of their own. The litany of facts comes alive in vivid, descriptive language, lending a philosophical, elegant and mystical aura to current scientific findings. Kim’s incredibly unusual illustrations are sublime. Employing varied painting techniques, vivid colors, multidimensional cutouts, unexpected materials and unusual textures, she creates a view of nature that is at once real and otherworldly. This is a work that demands to be read and reread, studied and examined, and thoroughly digested. It is perfect for sparking adult and child conversations about our place in the universe. "Readers learn interesting facts about themselves and are urged to make parallels to the planet at large. Meanwhile paper cutouts of children travel from page to page in the mixed-media dioramas, illustrating the text's assertions in a fantastical way...each one provides much to consider and absorb." "This is a book that reveals both the relationships and parallels between humans and the planet they live on, something children think about a lot...and it does so in a clear and compelling way...Don't miss this one, which begs to be shared intimately with children. Gather together, be still, and learn how we are stardust." "Elin Kelsey has produced a highly engaging book . . . The illustrations are fantastic and make a complex subject conservation and sustainable living easy to understand."